Meat causes inflammation, pain and aging. – Actor George Burns said that “you can’t stop getting older, but you don’t have to get old.” Considering he lived to be 100 and was active until just before his death, his words have more impact than most. The scientific pursuit of understanding aging is robust, and significant amounts of money are being spent on researching strategies to delay or reverse the damage aging creates. It is important to understand what inflammation is, how it relates to aging (sometimes called inflammaging), and how one food group, meat, promotes inflammaging. Meat causes inflammation and pain. Inflammation is a complex process in which cells and chemicals in our bodies fight infections and other threats, and it can be activated acutely or long-term. If a threat is detected by the immune system, chemicals like histamine are released that cause blood vessels to dilate, permitting white blood cells to arrive to clean up the area. 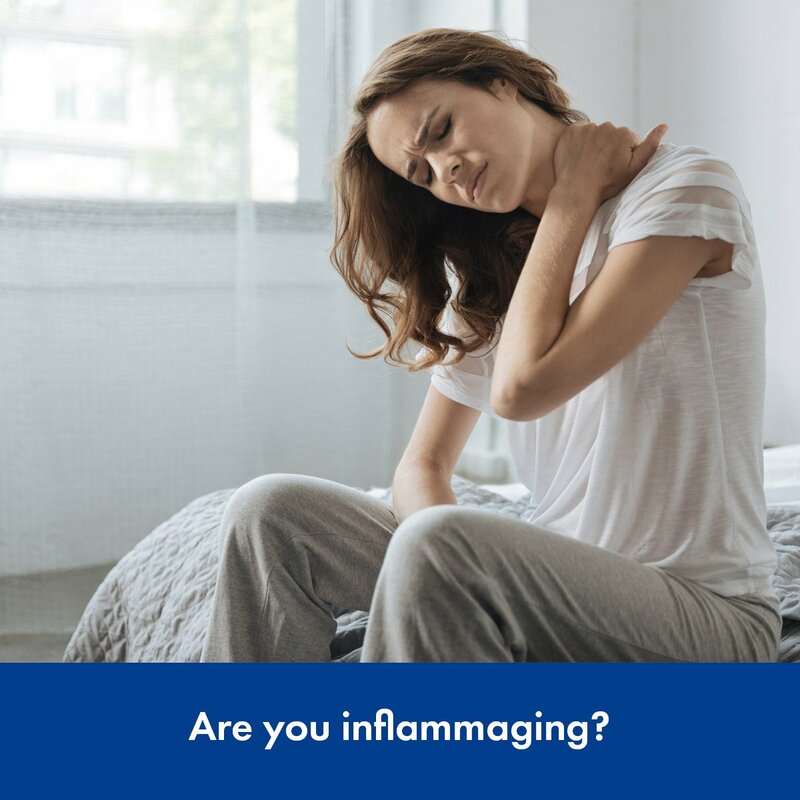 While inflammation can protect our health when it’s an acute response like a bug bite or infection, chronic inflammation is a different story. Many medical illnesses are caused by the chronic activation of inflammatory pathways. These include asthma, chronic pain, acne, celiac disease, rheumatoid arthritis, and even atherosclerosis of heart arteries. In fact, in 1856 Rudolf Virchow proposed that arterial disease was an inflammation of blood vessels and recently the role of inflammation in initiating heart disease events was proved. You want to do everything you can to avoid increased levels of chronic inflammation, and the ability to measure inflammatory status in blood tests has advanced greatly. More than half of our immune defenses are located in our gastrointestinal tract to monitor the foods that we eat. Foods can be inflammatory and initiate a chronic response if eaten over and over, and other foods can be anti-inflammatory. It is important to consider the question of whether meat can sustain inflammation and promote aging. The following data favours that meat is a source of inflammaging you might want to avoid. Elevations of hs-CRP (high-sensitivity C-reactive protein) predict the development of serious illnesses, including cardiovascular disease. Multiple studies have found that, even after correcting for confounding factors, meat consumption associates with increased hs-CRP. According to Joel Kahn, MD C-reactive protein is a protein the liver makes when there is inflammation in the body. Blood measurements of hs-CRP are often performed to assess the risk of future heart disease. A recent basic science study performed in mice demonstrated that an amino acid found in high levels in meat, methionine, increased oxidative stress and inflammation and actually reduced heart strength, too. A human study just published related meat intake to higher levels of arachidonic acid, another mediator that promotes inflammation and aging. And a diet low or absent in meat was recommended for optimal health. Another route by which cellular aging may progress is the development of insulin resistance. Insulin resistance is when the body’s cells don’t respond properly to the hormone insulin. Insulin resistance is the driving factor that leads to type 2 diabetes, gestational diabetes, and prediabetes. Scientists looked at how eating certain foods affects the release of insulin. Surprisingly, some protein-rich and fat-rich meats induced as much insulin secretion as did some carbohydrate-rich foods (e.g., beef was equal to brown rice). The researchers found that fish, beef, cheese, and eggs had larger insulin responses per gram than many carbohydrate foods. The scientific fact that meat is insulinogenic is rarely mentioned and may contribute to aging. Insulin-like Growth Factor 1, or IGF-1, is a peptide hormone stimulating cell growth. It’s also linked to higher risk of breast and prostate cancers. Meat eaters consistently have higher levels of IGF-1than vegetarians or vegans. Breast and prostate cancers are rare in traditional Asian communities, which have a very low intake of meat products. Okinawans, some of the longest-living people on the planet, eat a diet with less than 10% of their daily calories from meat. 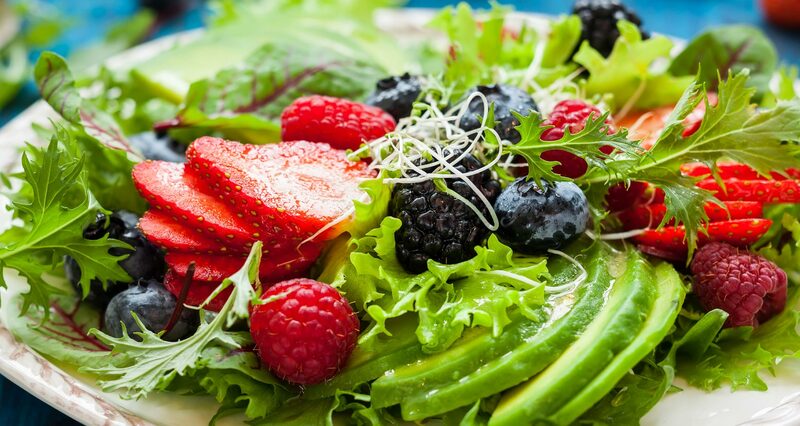 A plant-based fasting-mimicking diet has been shown to reduce levels of IGF-1, which has an anti-aging effect. In 2011, researchers from the Cleveland Clinic demonstrated that meat eaters produced a metabolite that promotes heart disease, called Trimethylamine-N-Oxide or TMAO. Of great interest, TMAO was not elevated in vegans who were asked to eat a meat meal for the purposes of the study. Persistent Organic Pollutants (POPs) are toxic synthetic chemicals that accumulate in fat. Some of the POPs are PCBs, dioxins, DDT, and flame retardants used in clothing and furniture. They disrupt endocrine pathways and are linked to cancer, heart disease, hypertension, obesity, and diabetes. POPs enter our body largely from animal products that we eat. For example, levels of PCBs in animal fat found in meat is much higher than the levels found in vegetables, fruits, and cereals. Advanced Glycation End-Products (AGEs) are naturally occurring compounds in food and can be increased by cooking on dry heat, such as on a grill. AGEs are associated with a variety of diseases including brain inflammation, diabetes, heart disease, and cancer. Levels of AGEs found in meat are many multiples higher than in any fruit or vegetable. The irony of the chemical term AGE is not to be missed as increased levels of AGEs lead to premature aging and are best avoided by skipping the meat entirely. Recently, a bizarre addition to the tale of meat and inflammation has been described, and a tick is to blame. New data exists that the bite of the lone star tick, quite common in certain areas like Virginia, can cause an antibody to form that reacts to a carbohydrate in meat (yes, there are carbohydrates in meat from the blood groups in the flesh) called alpha-gal. These antibodies can cause a severe allergic reaction the next time and every time red meat is eaten after the antibody forms. In an even newer research study, over 25% of heart patients tested had the antibody for alpha-gal, a component of red meat, and those that had the antibody had more advanced heart disease than those that did not have the antibody. While the quality of meat, such as grain or grass-fed, may have a small impact on inflammation in limited studies, meats of all types will favor inflammation and aging. Of course, no matter what you choose to eat, fill as much of your plate as possible with the most proven inflammation-fighters and anti-agers around: vegetables. Are you thinking about making some changes to your diet or lifestyle? Are you interested in eating more healthily, more in harmony with nature? Are you at a lost where to start, and lack the sufficient knowledge to make a dietary transition? Have you decided that a plant based diet is the direction that you would like to go? If you have answered yes to any of these questions then let us help you. We offer regular Gourmet Yogi Retreats that helps you transition your diet with the correct and up to date knowledge, as well as plenty of dietary advice, and well as learning and practicing Healing Somatic Whole Body Awareness Yoga. We answer all your concerns, such as ‘where do I get my protein?’, ‘where do I get my vitamin B12?’, etc. We even get hands on with our talented Vegan Chef to help you build a collection of delicious, nutritious recipes for all occasions. Are you ready to take your health and energy to the next level?